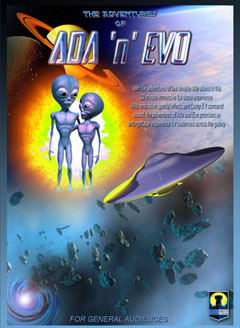 The Adventures of Ada 'n' Evo is about two lovable little aliens. They begin their story in another quadrant of the Milky Way where Evo has been asked to teach his little sister Ada how to operate the family's flying saucer. It is the latest craft made by Drof – the Galaxy Limited Edition. Evo is showing Ada how to negotiate an asteroid belt when the craft goes out of control after clipping an asteroid. Unable to control their craft, Ada & Evo are caught in a black hole and are transported to a far off part of the galaxy, which turns out to be our solar system. Finding they are low on water (an essential fuel for all Drof craft) they set off on a quest to find water in our solar system. After visiting all the planets, except Earth, Ada & Evo eventually find underground water on Mars after a spectacular journey to the icy poles of the red planet. Throughout the film, the emphasis will be on educating audiences about our galaxy and solar system and such cosmic phenomenon as black holes.